Breeding Imperfection: with apologies to Mr. Pratchett..
with apologies to Mr. Pratchett.. Right now, the Eldest is happily counting to 200 by ones (a process long enough to wear down even the strongest feeling of maternal pride. SEV'NTY ONE! SEV'NTY TWO! SEVN'TY THREE! Sigh.) and to 100 by tens, a far kinder approach. I love this, partly because my feeling is that the more flexible he sees numbers to be, the more he realizes that they are made of bits and parts, like words, the more approachable they will be for him. Or so I fondly hope. Meanwhile, however, the Toddles decided to join the fun. Naturally, we have numerical flashcards in the house (how not? I remind you to consider the source..), and the Toddles likes them. Today, however, he surprised me. 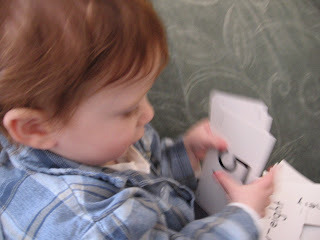 Toddles (holds up card): EYT! Me: oh, that's nice, sweetie. Toddles (holds up card): NYNE! Me (lifting head sharply from coffee cup): Hunh? Yes. Eight and nine. Does he understand the words? No. But he certainly has heard the progression often enough to be able to parrot them to me. Nor is this the first time. And in case I'd missed the point, the Man showed me dancing columns of numbers tonight, the product of a year's dreams and hopes for his bonus check, now pinned and slender on a page. Here's a different number: http://www.myfootprint.org/ I apparently require 11 acres. How many do you need to sustain your lifestyle? I'm wondering if a sub-grouping should be made for families with young children. Certainly I found the urge to use disposable baggies, containers, paper towels shot right up when the boys arrived - not to mention diapers! That's a hefty ecological footprint right there. It's funny, but part of me says that I should feel smug that I'm a rag-using, mostly cloth diapering, organic veg buying mama. Instead, I can hear my mother laughing. Yup, my mom, who early on suggested rags, cloth diapers and babywearing (aka wraps and mei tais), to my horror, not to mention doulas and homemade cleaners. She now sees me doing all of that plus the organic stuff (insofar as the horrified Keeper O the Budget will allow). Giggle away, Mum - you've earned this one. I certainly didn't see it coming. So when things like this sneak up on you, do you get to be smug or quietly shocked by the person you've become? Just do me a favor, folks, and on the day that I buy washable pads for myself or, heaven help us, a Diva cup, please sit me down and do a full neuro exam. 'Kay? Veggies vs Cookies. Nah. Couldn't be. Oh, man! I need 12 acres. And here I was, feeling so smug because I work 2 miles from my home, never travel via car (I walk to work a lot; otherwise, bus and subway), only eat meat 1-2 times a week (Shabbat), and live with three other people in a two-bedroom coverted to a three-bedroom apartment. But, alas, I get organic spinach from California and red peppers from Mexico and tomatoes from Israel, all of which is really quite terrible for the environment. Quite eye-opening in any case. Thank you! do you compost and plant your own veg in summer? it's a great way to get the veg you like and a a more reasonable cost than the organic stuff that other people grow. not only that, but the kids can help with that too. dw, how did I leave that out! Yup, we compost (in the summer, when we don't have to walk down ice-slick metal spiral stairs to get to the composter), and we have a community garden plot, where we grow herbs and veggies. ALG, welcome to the blog. Sorry to hear about the 12 acres! It was a fascinating approach to take to the idea of sustainability. Toddles was trying to explain to you that 8*9 = 72. 23 acres for me...Oh well. My "big" house has tipped the scales. I weighed in at 12 acres.